All your employee data at one place, no matter where you're located. Create and manage different leave types. Get a summary of how many employees are present or absent. Hassle free! Generate payroll in a single click. Review and edit salary components at your ease. Gather applicants with shareable job pages. Shortlist, schedule interviews and select candidates with a simple drag and drop. Employee can Clock-in/Clock-out, Apply leaves, Check notice/news and more. SnapHRM provides a powerful dashboard, where you can view a summary of all the necessary information. 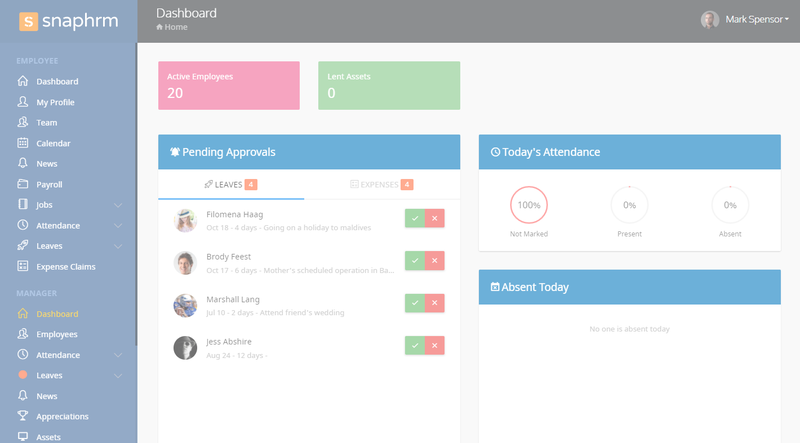 You can approve leaves, expense claims, view attendance summaries, events, reminders and more right from your dashboard. Watch SnapHRM demo video to get a glimpse of possibilities it opens for you. Don't take our word for it... Read what our customers feel about our product!